Pineapple and coconut are a favorite combination for cocktails. When you want to bring that tropical duo into a shooter, the cool colada is the way to do it! This shot has a flavor that mimics the piña colada. Instead of rum, it relies on pineapple and coconut flavored vodkas. The recipe is courtesy of Van Gogh Vodka and naturally recommends their brand for the two spirits. However, they have since stopped making the coconut vodka, so you will have to look for a substitute. Cîroc Vodka makes one of the best options, New Amsterdam Vodka is fantastic as well and more affordable, and a few other brands, including Pinnacle, offer the flavor too. With the vodkas at hand, all you need for the cool colada shot is a little pineapple juice. 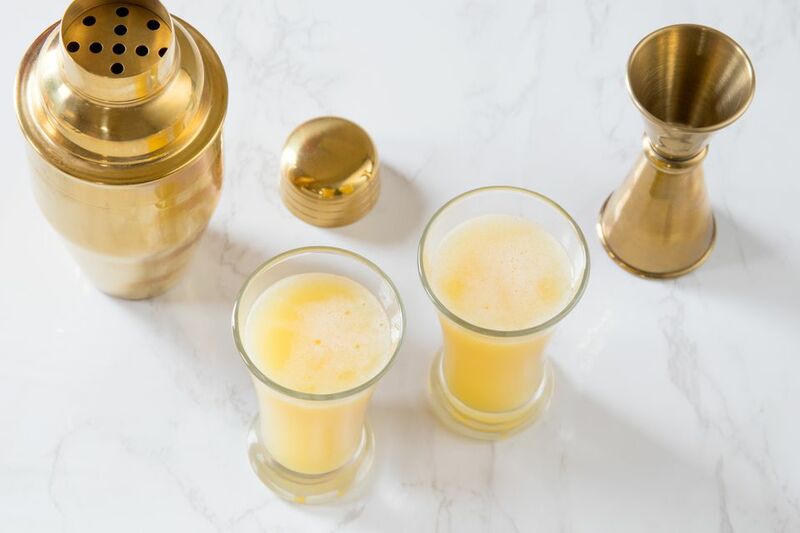 It's a fun little drink with a tartness that's sure to grab your attention, though the coconut does a fair job of mellowing it out so it goes down nice and smooth. In a cocktail shaker filled with ice, pour the vodkas and pineapple juice. This shot will shake up to about 2 1/2 ounces, so a large shot glass is required. If you don't have one of that volume, strain it into a rocks glass or a couple of smaller shot glasses instead. When you're sharing with friends, go ahead and shake up a few shots at once. Line up shot glasses on the counter, increase the ingredients in proportion for the servings you need, shake it up and strain as you move the shaker down the line. This shot is just a little better when served in chilled shot glasses. Keep a few in the freezer so they're always ready and frosty when you need them. If you like the taste of the cool colada, don't reserve it for a shooter. Serve it on the rocks if you like or "up" in a chilled cocktail glass. When doing so, you might want to increase the coconut vodka to a 1-ounce pour to balance out the flavor. Can't find coconut vodka? Use coconut rum instead. The shot's taste will be nearly identical and since brands like Malibu are so popular, it should be in stock at almost any liquor store. How Strong Is a Cool Colada Shot? Many flavored vodkas (Van Gogh included) are bottled at 70 proof rather than the vodka standard of 80 proof. That does make this shot a little less potent, but it's still pretty strong. On average, its alcohol content should be in the 21 percent ABV (42 proof) range, so two of these shots would equal one of full-strength vodka.